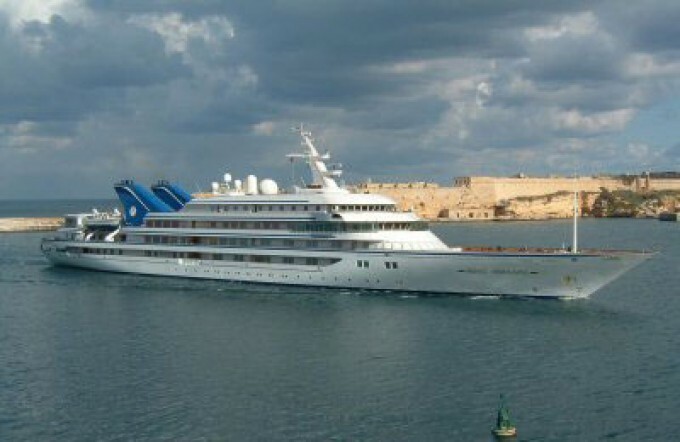 Mega yacht Prince Abdulaziz is a massive luxury yacht, measuring 147 metres (482'3'') in length and belongst to the fleet of the largest yachts in the world. Superyacht PRINCE ABDULAZIZ was constructed in 1984 in the Netherlands by Helsingor Vaerft, having received a comprehensive refit in 2005. Exterior design of this impressive motor yacht was created by Maiernform Maritime Technology. At the time of her delivery PRINCE ABDULAZIZ was the longest and the tallest motor yacht in the world. PRINCE ABDULAZIZ yacht was constructed with steel hull and steel superstructure, boasting a beam of 18,30 metres (60ft) and a 4,88m (16ft) draft. She is fitted with excellent stabilisation system, reducing roll motion effect and results in a smoother, more comfortable cruising experience on board. Accommodation aboard 147m luxury yacht PRINCE ABDULAZIZ was created for 64 guests, who are taken care of by an impressive crew of 65 professional and highly trained individuals. Her ultra-luxurious interior was designed by David Nightingale Hicks. PRINCE ABDULAZIZ superyacht is propelled by two 5,816 kW Pielstick diesel generators. She can comfortably cruise at 18 knots and achieve a maximum speed of 22 knots if needed. Sixty four guests are accommodated on board the luxury mega yacht PRINCE ABDULAZIZ, serviced by a crew of about 60-65 highly professional and trained members. We do have available further amenity, owner and price information for the 147 m (482'28'') yacht PRINCE ABDULAZIZ, so please enquire for more information.